I had a moment of sheer revulsion this weekend. And that's not easy, I'm not a squeamish person. But watching my friend eat a FROZEN OVEN CHIP (fries to the Americans on here), straight from the bag, like it was the most normal thing in the world turned my stomach. What's worst was he was surprised that we didn't all do it! He was convinced that his wife would think it was normal as well, but she was as disgusted as the rest of us. What do you eat that everyone else finds disgusting? Kev - all i can say is that you must be trying to bring in a new readership or something - bahahahaha! eating frozen fries from the bag?!?!!? did he dip them in ketchup or something? 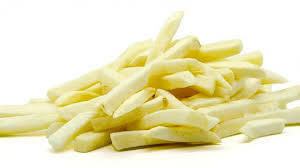 oh crap - we don't even eat frozen french fries - we produce enough potatoes for the year so that we are always eating fresh-from-ground-potatoes.....mashed, smashed, baked, roasted, and french fried. please tell me that you had no idea what to post and so you made this story up. your friend is in some real trouble later in life. eating them frozen from the bag? arhghghghgh! I did have writers block, But ti did happen. He did it in front of a group of us and then acted like it was normal! We do use frozen chips occasionally because they make such an easy tea. We always cook them first though! I use to love pickled eggs with a pint when I lived in England. You must have some building site dare bets stories Kev. Each to their own, but that is decidedly odd. well, once when i was stoned i ate a frozen pizza on the way home from the grocery store. but then, i was 19 and stoned. I'd be afraid to chip a tooth on a frozen chip! My husband loves to eat frozen "chips" and tater tots too. Not a lot, just a few. When I was young my friends and I liked to eat french fries dipped in a Wendy's Frosty (that's an American fast food chain and the Frosty is like a weird chocolate milkshake). I love eating kimchi over rice with a fried egg on top. My husband thinks I'm nuts! My favorite lunch is whitebeans and kale cooked in anchovies and garlic. With an egg on top. Husband thinks that's pretty gross. I can't thing of anthing to write about either. I cant understand why anyone eats food so hot and spicy that it it painful, best example being curry, when they go red in the face from the heat. What is the point? The snacks here had a smooth taste with a bit of cheese and lime juice. To start, we got pork rinds at LA venue here; they were really flavorful with a spicy kick and smooth taste. Plus, it was a large fresh bag too, place is worth the price. People are horrified when I eat or talking about eating a sandwich with Miracle Whip on one side and peanut butter on the other with sliced bananas. Miracle whip is a very tasty American spread like mayonnaise only better. Friends and colleagues always look at me strangely when I suggest they try dipping a hot French fry into cold ambrosia custard.... sounds odd, but is actually delicious. In 20 years I predict chips and custard will be the same!